The Diamond Producers Association (DPA) and Signet Jewelers have published the first results of their ASSURE Program to independently and objectively test the performance of laboratory-grown diamond detectors (Diamond Verification Instruments). The program intends to eventually test and identify each machine on the market concerning how well they detected or referred man-made stones, including the rate at which they gave false positives. HRD Antwerp, Europe’s leading reference for diamond and gemology education, diamond certification and grading, this summer (June 3-7) is launching a course in Rough Diamond Management and Production Control. The course will introduce the business concepts required to acquire and trade rough diamonds, foremost among which are various techniques for determining the value of rough stones, the key component at the basis of any career in rough diamond trading and management. The Antwerp World Diamond Centre (AWDC) and Alibaba Group announced today that they have entered an exclusive partnership to offer Antwerp certified diamonds directly to Chinese consumers via Alibaba’s B2C marketplace, Tmall. The cooperation agreement was signed in the framework of the first China International Import Expo (CIEE), which is being held this week in Shanghai. HRD Antwerp today launched its new diamond ID CARD: a highly affordable grading report for diamonds that weigh between 0.08 and 0.998 carats. "With this new product, we aim to bring a comprehensive solution to one of the diamond market’s main current challenges: ensuring confidence in small-sized diamonds," says Michel Janssens, CEO of HRD Antwerp. Last week HRD Antwerp, a leading diamond grading and certification lab, detected two stones fashioned to imitate rough diamonds in an apparent attempt to fool a trader. This following a similar discovery of two large topaz crystals, fashioned as rough imitators, in July. The two rough stones were submitted to the lab, and in this case the stones “felt” like rough diamonds, however the density measurement identified the imitations as moissanite. Last week, a leading diamond grading and certification lab HRD Antwerp detected two large topaz stones fashioned to imitate rough diamonds in an apparent attempt to fool a trader. 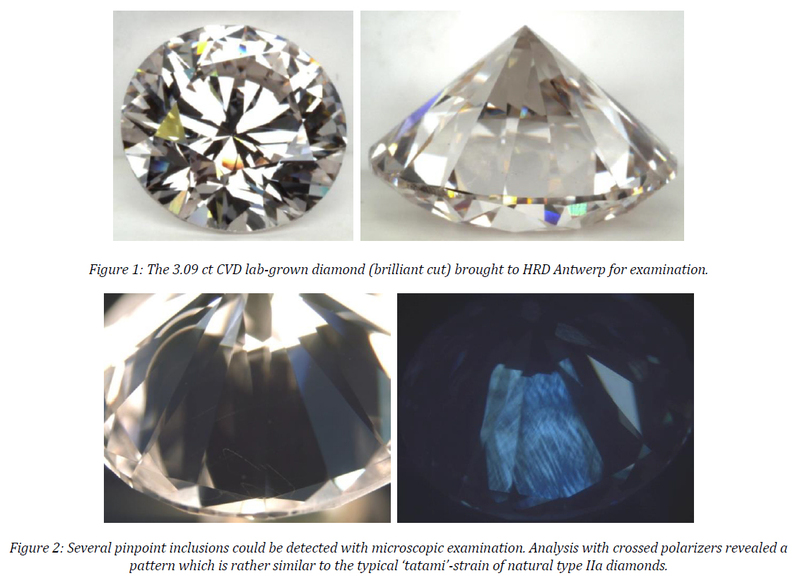 "Two large, near-colourless rough stones weighing 50.08 and 38.18 ct were submitted to our research department to determine their quality," HRD's statement reads. "The results indicated that the gemstones, believed to be diamonds, were actually topaz. Representatives from the Antwerp diamond industry were on board today for Brussels Airlines' first official direct flight from Brussels to Mumbai, where HRD Antwerp diamond certification lab is opening its new, expanded offices and the Antwerp World Diamond Centre is holding an information session for the Indian banking sector. The diamond delegation is participating in a Belgian economic mission to India spearheaded by Secretary of State for Foreign Trade Pieter De Crem. From 11 through 14 December, the Antwerp World Diamond Centre and HRD Antwerp are participating in the City of Antwerp's economic mission to Seoul, South Korea, after which it heads to Shanghai. Highlights of the trip to Seoul include HRD Antwerp's announcement it will be offering bilingual diamond grading reports as of February 1, 2017, with the first reports available in English/Korean and English/Chinese. HRD Antwerp will gradually offer bilingual grading reports in other foreign languages over the course of the next year. As announced last week, the Antwerp diamond bourses will make it possible for all its members to avail of HRD Antwerp screening technology at no cost. This initiative adds a second layer of confidence, as polished diamonds imported to Antwerp from India are already checked at AWDC's Diamond Office. HRD Antwerp inaugurated its flagship store on 23 June 2016 in Paris. It is the result of an exclusive partnership between HRD Antwerp, Europe’s leading authority in diamond certification and selected retailers. Peter Macken, CEO HRD Antwerp, said: "HRD Antwerp is the leading authority when it comes to certification, education and equipment. We aim for perfection in everything we do, delivering the highest quality in all our products and services. HRD Antwerp, Europe’s leading diamond certification authority, has inaugurated its new Mumbai office extension and launched a new melee diamond screening service. At the center of this service is M-Screen, the world's fastest automated melee screening device that screens round brilliant diamonds from 1 point to 20 points for potential lab grown diamonds, potential HPHT colour enhanced diamonds and simulants. The M-Screen automatically feeds, screens and sorts out round brilliant diamonds at a speed of minimum two diamonds per second (7,200 diamonds per hour). Diamond grading and certification lab HRD Antwerp has launched a new track and trace feature so that clients can now track their diamonds throughout the grading process. This new functionality provides a complete overview of the whereabouts of the client's diamonds or jewels within the HRD Antwerp Diamond Lab. The feature is a new addition to "My HRD Antwerp", a secure, 24/7 online service that provides global access to the HRD Antwerp certificate archive and transit results. HRD Antwerp Hong Kong has opened its new office in Kowloon, sharing the same premises as the Hong Kong Indian Diamond Association (HKIDA). Will Light Performance Help Standardize Diamond Grading? The contentious issue of certificates and the different labs decision-making standards on cut, angles and symmetry ratios could be aided by work taking place on defining the criteria that determine a diamond’s optimum performance when it comes to reflecting and transmitting light, writes Rahul Jauhari, the Commercial Director India for HRD Antwerp, in Gemkonnect. "Light performance could well be the one criterion that overrides all the other criteria when it comes to determining whether or not a diamond has been cut the very best way it could have been. The Indian government on 30 March exempted from customs duty cut and polished diamonds imported by HRD Antwerp's Mumbai Diamond Institute for grading and re-export, taking the number of such entities enjoying the facility to four. In July last year, the Central Board of Excise and Customs (CBEC) had exempted from customs duties cut and polished diamonds imported for grading or certification and re-export by three laboratories and agencies. HRD Antwerp and the Hong Kong Indian Diamond Association (HKIDA) recently signed an agreement on an exclusive diamond-screening service using the M-Screen. The M-Screen is “the world’s fastest melee-screening device available today,” HRD Antwerp said. The new service will offer the screening of parcels – with a minimum total weight of 10 carats – of melee-sized diamonds from 1 to 20 points and colours D-J straight from HKIDA’s premises in Kowloon. Gems and Jewellery Export Promotion Council (GJEPC) Chairman Praveenshankar Pandya and Bharat Diamond Bourse (BDB) President Anoop Mehta strongly reiterated at the opening of the Diamond Detection Expo & Symposium in Mumbai that the Indian diamond industry is totally committed to preventing the undisclosed mixing of synthetic diamonds in order to maintain consumer confidence in natural diamonds. Pandya announced that the industry would be forming a Natural Diamond Monitoring Committee (NDMC) in Surat along the lines of the similar body it has set up in Mumbai. Leading global gem labs and machinery manufacturers will exhibit their technology and equipment for the detection of synthetic diamonds at the Diamond Detection Expo & Symposium (DDES 2015) next month. There will also be seminars and panel discussions featuring experts and trade members. DDES 2015 is being organized by The Gem & Jewellery Export Promotion Council (GJEPC) and the Bharat Diamond Bourse (BDB) and takes place on December 15-16 at the BDB in Mumbai. Tomoko Kodera (Japan) won first prize and $10,000 at the recent 17th edition of the HRD Antwerp's International Diamond Jewelry design competition, "A la carte: A Culinary Diamond Journey". It is internationally recognized as one of the world's most important jewelry design competitions, its goal being to inspire and promote creativity in the design of contemporary diamond jewelry and extend the limits of modern diamond jewel and avant-garde ideas. The 16th edition of the HRD Awards, a biennial international diamond jewelry design competition, will hold its grand finale in Antwerp on October 29. The contest, which this time had as its theme 'À la Carte – A Culinary Journey,' is open to designers from all over the world. The interpretation of the theme is critical to the entry’s success, and the jewelry item must contain at least 1 carat of diamonds. The finale event will feature 29 exclusive diamond creations by international top designers. HRD Antwerp recently examined a 3.09-carat CVD lab-grown diamond. It was the first time that a CVD synthetic diamond of such a size was seen at the lab. CVD (Chemical Vapour Deposition) is a technique where diamonds are grown in a specially developed growing chamber using a carbon rich gas. The Antwerp World Diamond Centre’s “Diamond Power Sessions” made waves on the largest stage in the diamond and jewelry industry – the Hong Kong Jewellery & Gem Fair. More than 150 buyers crowded into the Antwerp Diamond Pavilion to hear the latest industry insights from Antwerp diamond experts on September 17 & 18, and the buzz was palpable. The sessions included presentations on marketing to Millennials, by AWDC Communications Manager Karen Rentmeesters, a presentation by HRD Antwerp’s Chief Education Officer Dr. Katrien De Corte, entitled “The Real Deal: Laboratory Grown vs.
Diamond certification laboratory HRD Antwerp has announced that it will be unveiling a new Automated Melee Screening Device, known as M-Screen, at the Hong Kong Jewellery & Gem Fair. The device, developed in a collaborative effort between the Scientific and Technical Research Center for Diamond (WTOCD) and HRD Antwerp, promises to provide ‘a super-fast table-top automatic melee screener' for commercial use.